We discuss possible hiking routes for today. Some are rejected because the new snow would make them more difficult. 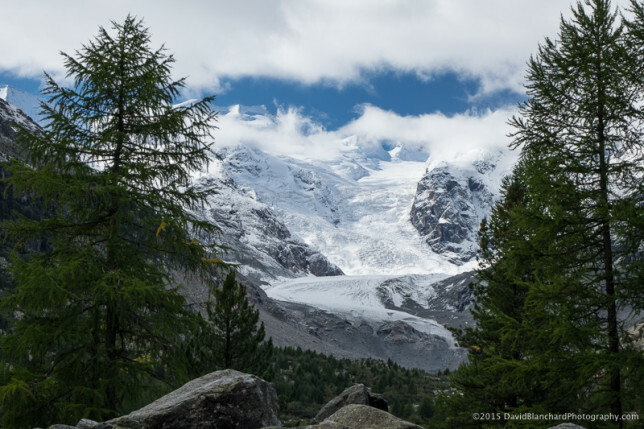 Finally, we choose an easy hike up Vadret da Morteratsch (Morteratsch Glacier) to the Chamanna da Boval (Boval Hütte), another SAC hut. 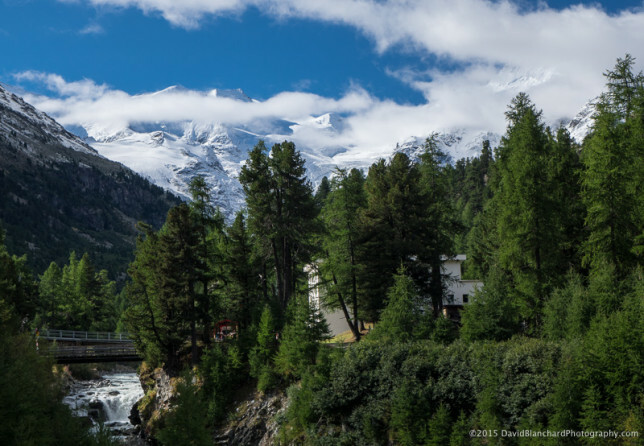 With clear skies we can finally see the summits of the Bernina Alps. 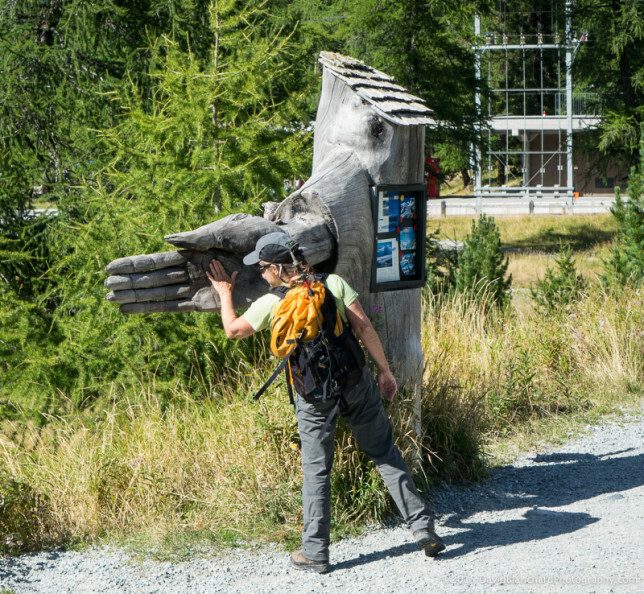 Sculpture at the start of the trail. The weather is fine—perhaps a bit cool and breezy but it makes for comfortable hiking. 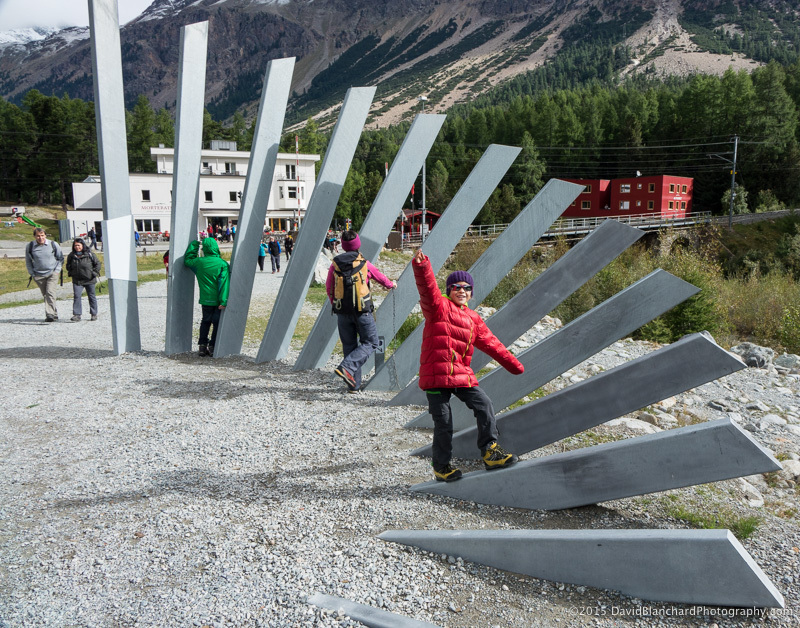 At the start of the hike there is an interesting interactive sculpture. It’s purpose is to let visitors know that glaciers are not quiet; they make a variety of sounds. By striking the provided mallet against different parts of the sculpture you can produce sounds that attempt to mimic those of a glacier. It’s a very interesting piece of science and art. Vadret da Morteratsch in the distance. 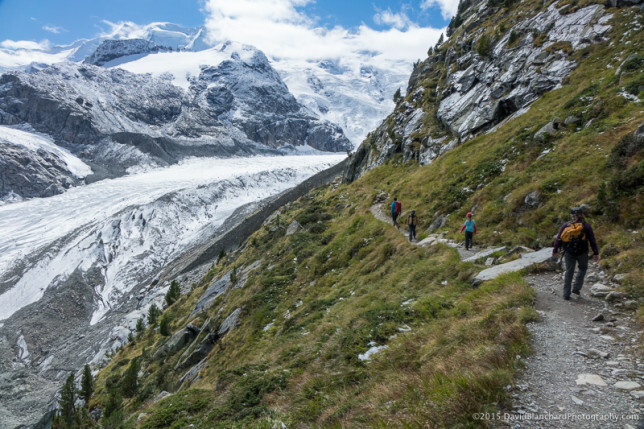 The hike climbs along and near the lateral moraine of the glacier at a modest incline for much of the distance only becoming moderately steeper towards the end. Panorama showing Munt Pers (left), as well as the Vadret da Morteratsch and Vadret Pers. We have a long lunch with hot tea at the hut before leaving to begin the descent. 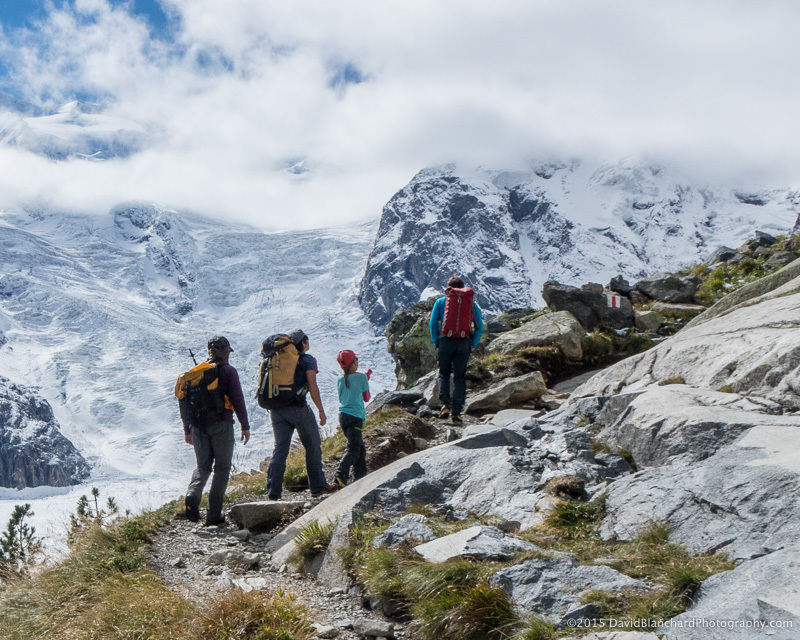 On the way down, we search for a way to descend the lateral moraine to the glacier below but much of the moraine consists of unstable rock and dirt. 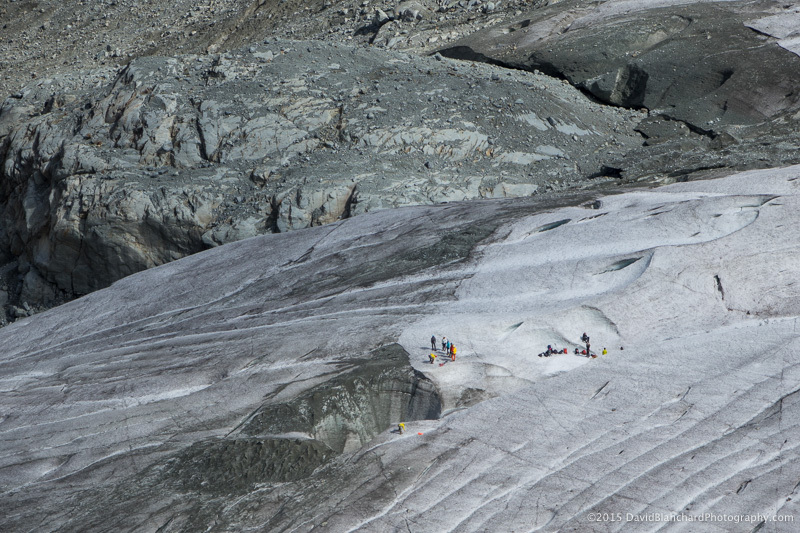 We find a way, finally, but are now too far down valley of the glacier. In previous decades, however, there would still be ice here but this glacier has retreated several kilometers in the last 150 years. There are signed markers showing the location of the toe of the glacier from 1850 to present. The retreat is astonishing. Glacier adventure hikers near the toe of Vadret da Morteratsch. We are dropped off at the hotel and bid farewell to our companions as they must return home that evening. 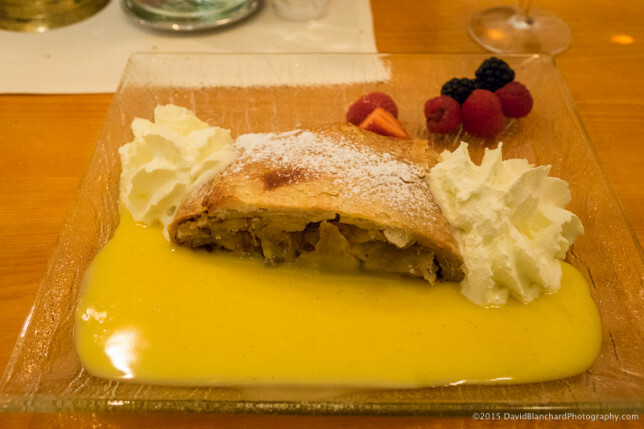 Apfelstrudel with vanilla sauce and cream served at the Engadinerhof Ristorante. 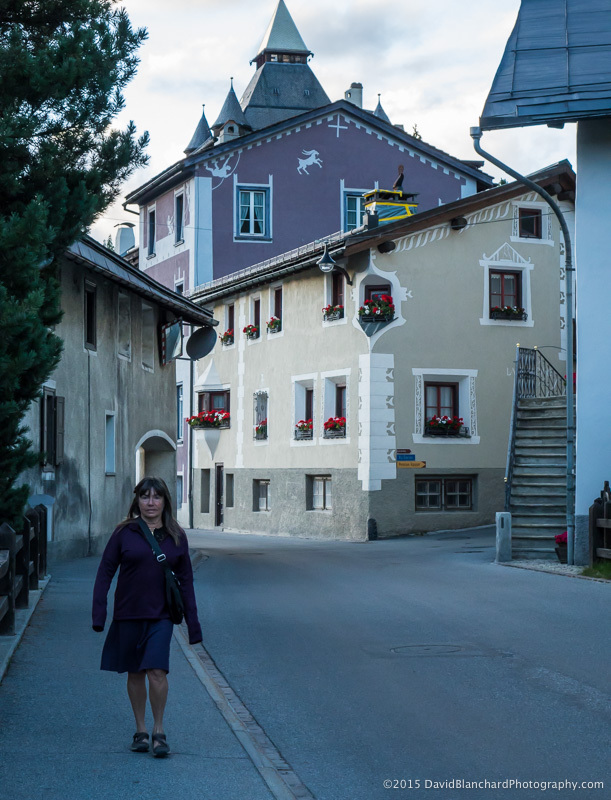 We take another walk around the narrow streets of Pontresina before having dinner at our favorite restaurant. I’m not usually one to photograph my food but this Apfelstrudel is amazing!